"Hotel room bathrooms are nice. However nothing is like your own one at home." same applies to your rig, and our one for that. 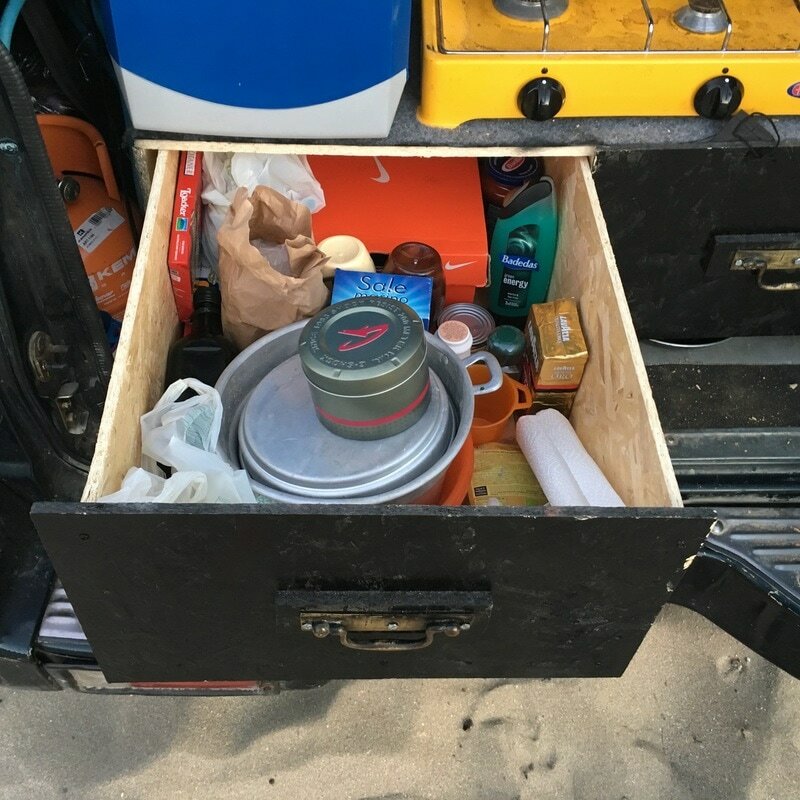 We all dream of having everything set up in the most efficient or useful way possible in our rigs. Piece by piece we want to figure out and customize Moka to best fit our needs and likes. Check out our progress and do not hesitate to suggest and, or, ask! We aim for ease of use, maximization of available space and coolness (not sure how we'll achieve that one). ​Packing. Ease of acess. Amount of gear. The struggle is real. You know what I'm talking about. 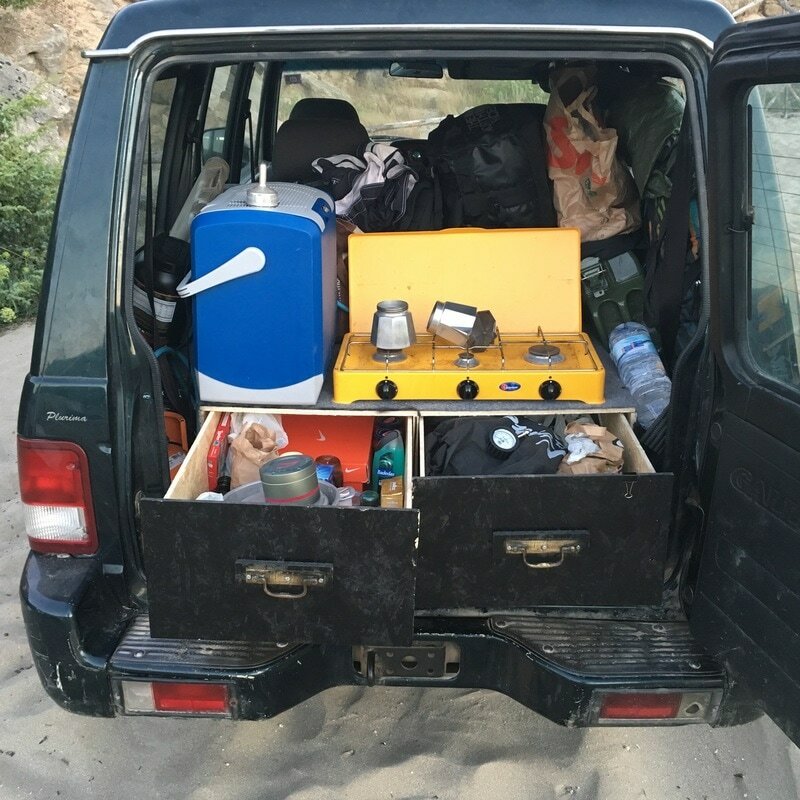 During our Expeditions or WE get aways we carry a variety of gear. Some of which is dedicated to that specific outing; other which lives in the vehicle 24/7. We always have a series of very basic safety and self recovery gear. Ranging from Flame Inhibitors to Strops and First Aid Kits. Most of the stuff we never use, however we like to be prepared. Problem: all this stuff just lying about is a plain pain in the rear. ​ Solution: find or make them a permanent but easily accessible spot to live. We purchased a light weight (200gr), eco friendly, extremely portable and maintenance free Flame Inhibitor produced by Italian company Blowy. 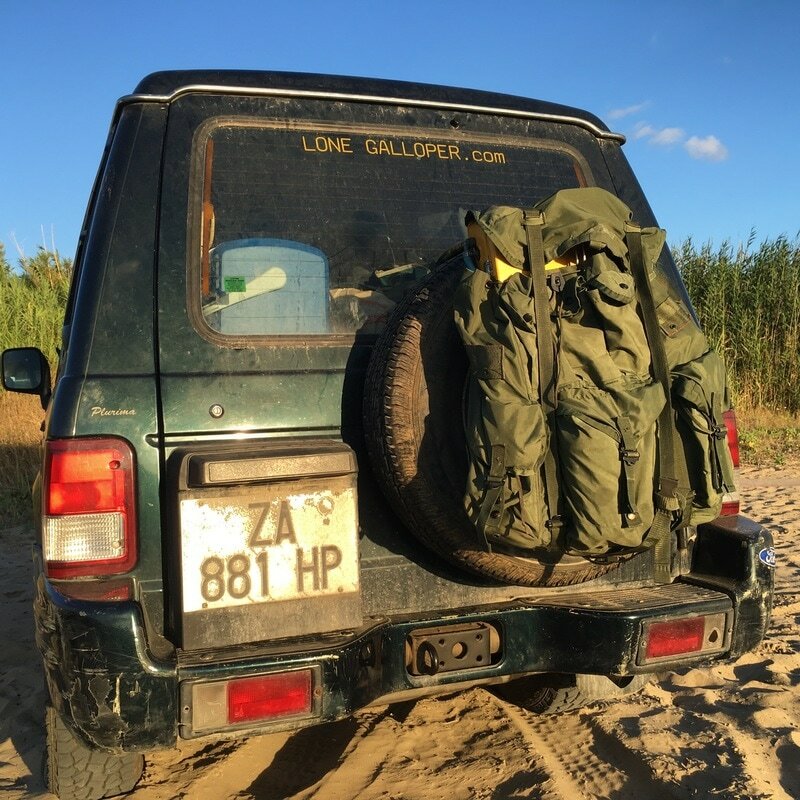 We purchased from the trusted and reliable Overland / Adventure supplier TopGear.it who provide great support and service and have a vast array of material and gear to outfit you vehicle for a basic expedition. The Flame Inhibitor lurked around the Galloper for weeks on end and Alberto finally decided to find it a new, permanent and easily accessible home. 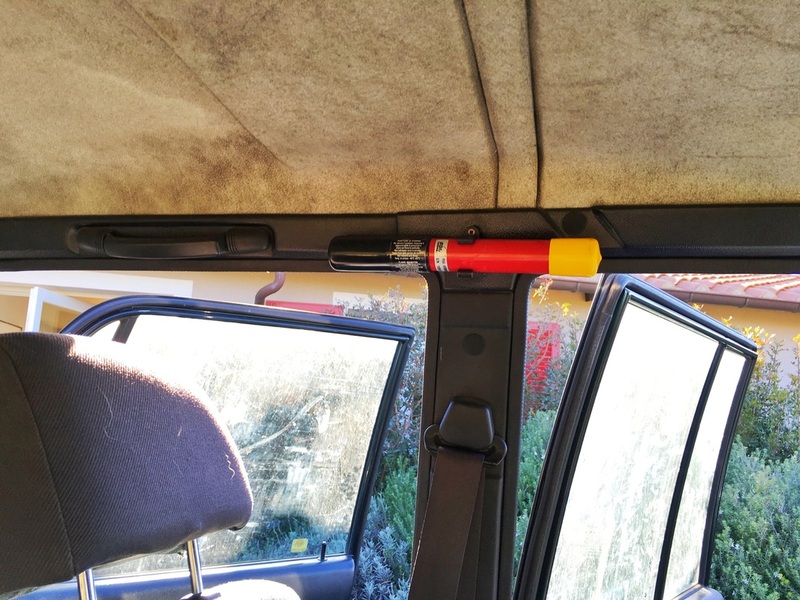 The Passenger Side B pillar. The Flame Inhibitor comes with a plastic mounting bracket which firmly holds the component in place. It does take a few pounds of pull to release it and has withstood off-road driving conditions with no squeaking or rattling. The bracket is mounted using two low profile (short) screws and a drop of super glue for added structural rigidity. Heavy engineering over here. The Flame Inhibitor is easily reachable by all occupants. 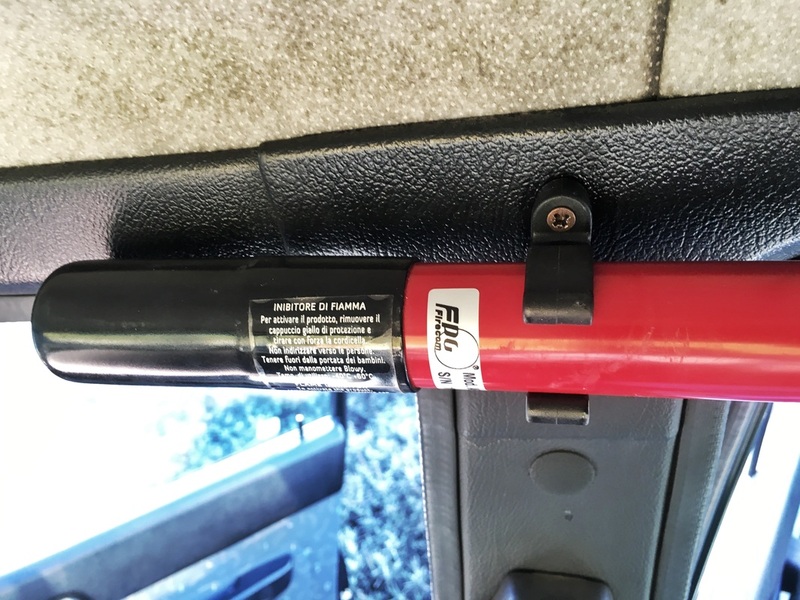 It is placed on the navigator [passenger] side so that in case of an emergency which calls upon the FI (Flame Inhibitor was getting old) the navigator or rear occupant can access and deploy it without interfering with the driver if the vehicle is moving. Little touch ups to the Galloper help with our image and make us feel better about our scrawny clothes and hair. Also it helps prevent rust, keeps us busy and gives us an excuse to get our hands dirty. We have found our match, we are in no way affiliated with AurorA lights, yet we feel like we want to spread the word about a great quality, maximum IP rating (IP69K) low draw and hyper bright and high definition, thoroughly well built product. We will be adding illumination as necessities arise. The two flood pods have been life savers since we installed them. Moka's stock head lights are half-a-candle-light in power and illumination, simply unsafe. Again: we are not affiliated with Aurora or any resellers or distributors, but we can give you our word that this is a bomber product! Personal space is technically limited to one medium sized soft (duffel bag / back pack) per occupant... however as we all now stuff starts to get strewn around moka easily. Alberto tries to keep things tidy but it rarely ever works, we're thinking about seat organisers to help out on this one. Bags containing all personal items are stowed in the trunk of the vehicle as niftily and tidily as possible. We are also looking into systems to strap everything down to ensure nothing goes ballistic. Can you guess what is in the G-Shock watch container? Making the most of what space we have we now have a fully fledged, light weight, aluminum alloy roof rack. We intend to make good use of it: as the Moroccan desert looms on the horizon we are looking to get a roof top tent and extra fuel on board... the roof rack will serve to create more room for other Expedition Specific equipment, it will allow us to securely and efficiently carry and deploy awnings, recovery boards, shovels, possibly fuel and light spares also permanently mounting lights. 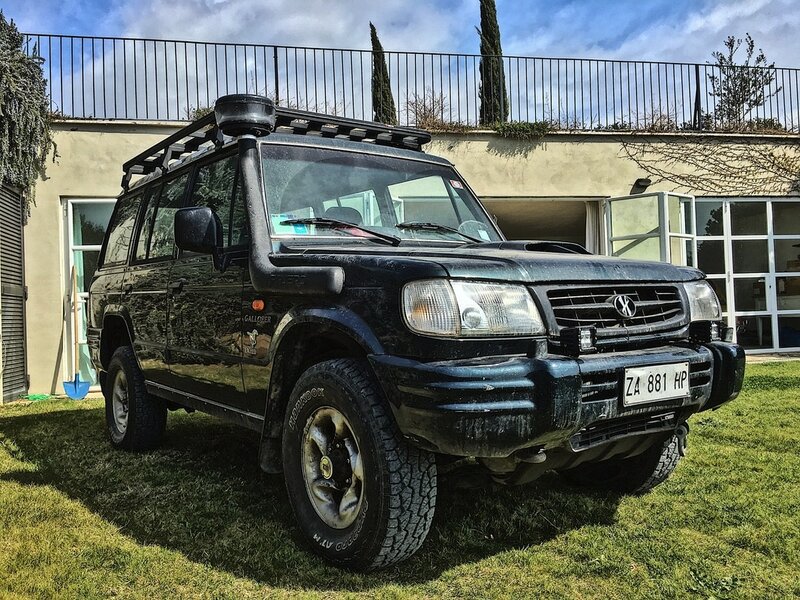 We will do our best to keep it as light as possible however jerry cans will probably end up on the roof rack and only filled when deemed necessary. Leaving as little a trace behind you is courtesy and kindness is a valuable currency, and just our damn responsibility (by our we include you too). To combat trash laden beeches, or simply for keeping dirty, stinky stuff outside of you vehicle we use a US ARMY gov issue A.L.I.C.E ruck sack mounted to the spare tire. Its proved to be a game changer. The large main bag can easily accomodate your trash. The smaller pockets can be used to store dirty recovery gear and what not... also this ruck sack was cheap compared to dedicated systems, and it looks way cooler!